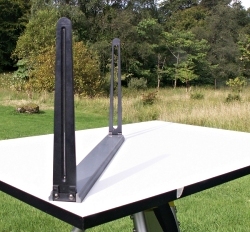 An alidade is an essential tool for use in plane table surveying. The Moidart History Group has tried unsuccessfully to find a supplier of a good-quality product — so Harry Clyne, a superb engineer within the group made a limited quantity for us. Harry passed away recently and in his honour we have renamed them. These precision-engineered CLYNE alidades are made completely from recycled materials, apart from the screws and the stainless steel sighting wire, with a solid hard plastic base and commercially-anodised aluminium sights. They are closely modelled on the alidades used by the RCAHMS Scotland's Rural Past project. The Moidart History Group has a small supply of these alidades still for sale - all profits go to group funds. They are available for £79.99 each, including delivery anywhere in the United Kingdom. Dimensions are 430mm long x 40mm wide x 15mm deep (some are 25mm deep) - the sights are 217mm high from the upper surface of the base, and the alidade folds flat. To order, using PayPal, click the 'Add to Cart' link below. Contact us for prices for overseas orders - we ship at cost. Alternatively we can accept cheques - but please email us first at ariel@moidart.org.uk.